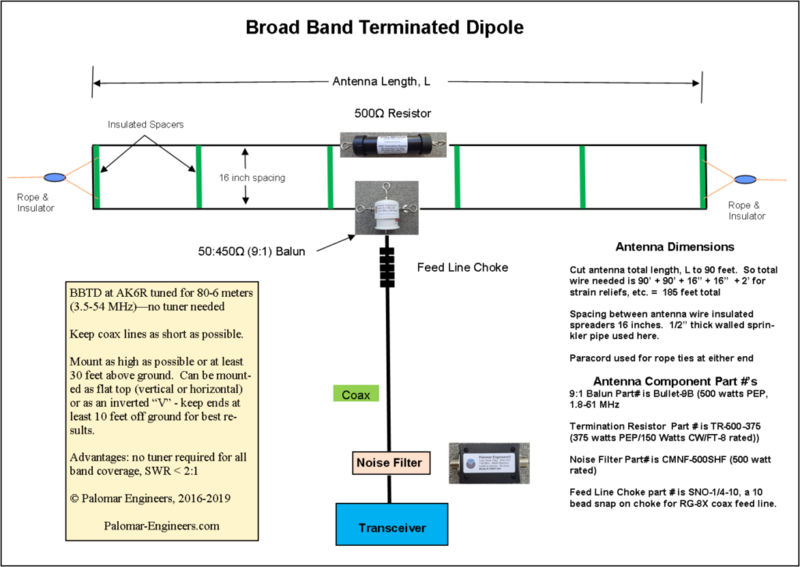 Broad Band Terminated Dipoles (BBTD), Tilted Terminated Fold Dipoles (T2FD) and Balanced Termination Folded Dipole BTFD) antennas can be designed to cover a large range of frequencies between 1.8 30 MHz. Longer length antennas generally provide better low frequency efficiency but take up a larger footprint of land. One BBTD that has worked well at the AK6R antenna farm is shown below. Many other designs are available and can be found at www.HFLINK.COM as well as other internet sites. Your mileage may vary using this antenna, but as a general coverage antenna for ham and shortwave broadcast, the simplicity can’t be beat even though an individual dipole on a specific band may out perform this broad band dipole. Palomar Engineers has all the parts you need to build this antenna, so why not give it a try? Depending on the source of the antenna design, different value baluns are specified. Our Bullet(TM) baluns in ratios of 9:1, 12:1 and 16:1 are excellent for this type of antenna as they are broadband from 1.8-61 MHz and will take up to 500 watts PEP.